Always within easy reach for the next break. Rolls, baguette, even hearty dark rye bread can be cut cleanly and precisely thanks to the serrated edge. Extra hard 1.4034 steel: Stainless, exceptional cutting properties and acid-resistant. Matching sheath made of brown camel leather available separately. 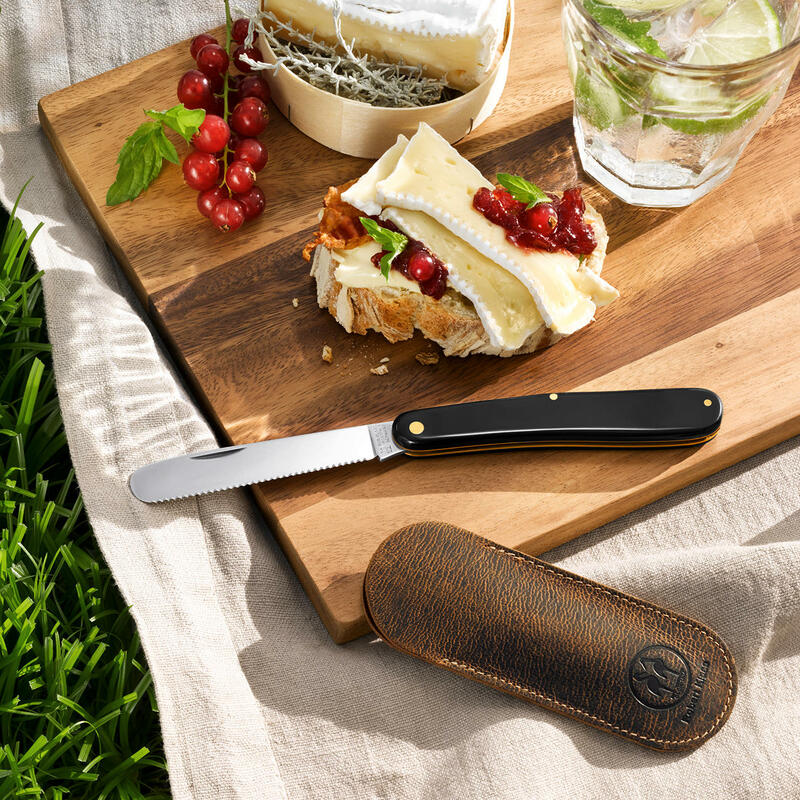 The perfect companion on the go: The snack folding knife in pocket format. Manufactured using traditional craftsmanship, made of stainless steel. 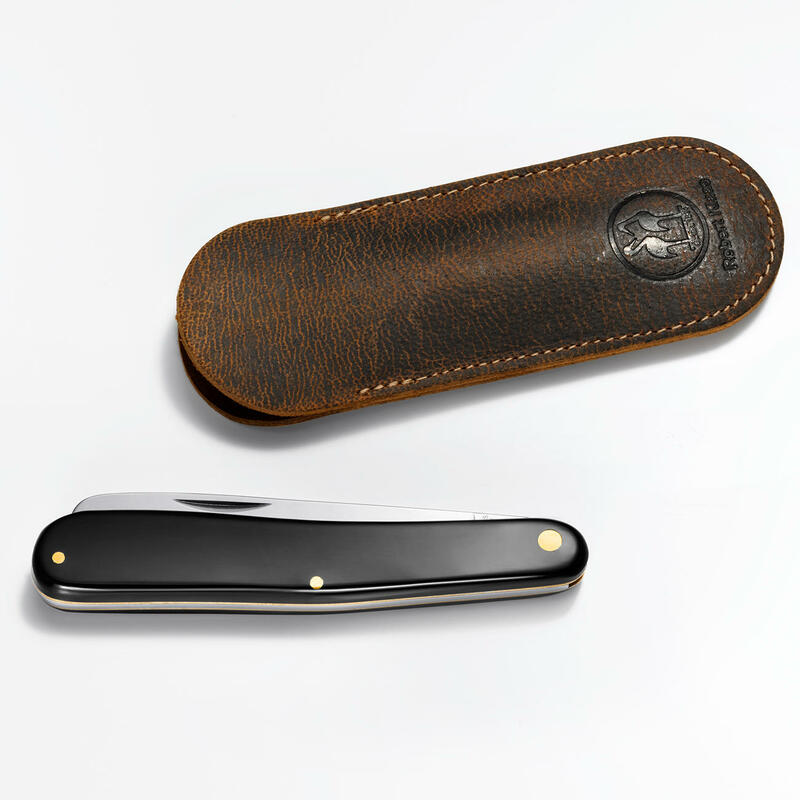 Made in Solingen, just like the predecessor from 1932. The model of this folding knife was already in the sample book for Solingen cutlery manufacturer Robert Klaas in 1932. The company founded in 1834 and steeped in tradition still makes the fine classics largely by hand. Ideal for at home or on hiking and cycling tours, in the car, camping, and so on. The folding knife distinguishes itself from pointed pocket knives with its serrated edge on the side and round cartridge. You can prepare your snack just as you would with a classic roll knife – always fresh, on the spot. Even croissants do not crumble as much. You can portion fruit, tomatoes, cucumbers and fine slices of sausage or cheese perfectly. The wide, rounded blade allows spreads to be applied nice and thinly. Butter, meat paste, honey, ... spread it evenly over the entire cut surface. The high quality steel has a hardness grade of 56 HRC (instead of the typical 52 HRC). Sturdily riveted plastic handle. Measures approx. 18.8cm (7.4″) opened, closed 10.5cm (4.1″). Blade approx. 7.7cm (3″) l, approx. 2mm (0.08″) thick. Weighs approx. 56g (2 oz). Made in Solingen, with “storks” embossing (Klaas company logo). Measures approx. 12 x 4.3cm (4.7″ x 1.7″). Weighs approx. 16g (0.6 oz).